St. Maarten beaches have some of the best white sand on the planet for you to experience and the plethora of activities are magnificent. Stellar options include Maho Beach where you can feel the roar of an airplane passing overhead while you sun yourself on white sand. Other choices include Great Bay Beach which stretches the length of Philipsburg and if you like watersports like surfing or bodyboarding then Mullet Bay Beach will please you. Divi Little Bay Beach is the ideal place to spend the day snorkeling or riding a jet ski and the soft white sands at Dawn Beach are a superb place to watch the sunrise within a tropical landscape. Whether you want to watch the sunset at Cupecoy Bay Beach or simply relax at Kim Sha Beach, there is a St. Maarten beach that will be superb for you. If you are looking for a peaceful beach to spend the day relaxing, this may not be the beach for you. 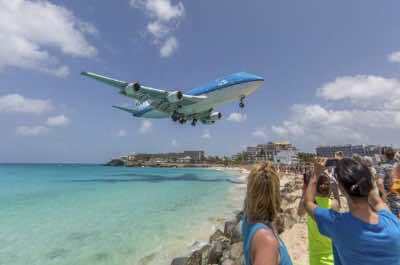 However, if you are a lover of all things to do with airplanes, then visiting Maho Beach is a unique thing to do in St Maarten. Maho Beach is situated right next to an airport and planes fly low overhead as they come in for landing. Feel the powerful jet blasters as the planes take off and land seemingly right on top your head. Kids and adults will have a blast! Enjoy a half-day trip on a luxury bus that combines Maho Beach and Orient Beach for a combination of planes and snorkeling. 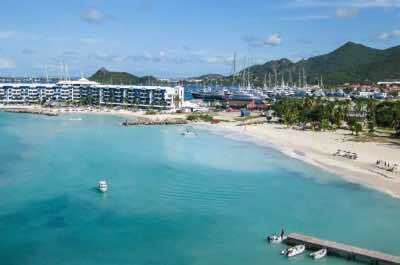 Philipsburg is a city that offers a beach that runs the length of the town. You are never far from the clean white sands and the crystal clear water! 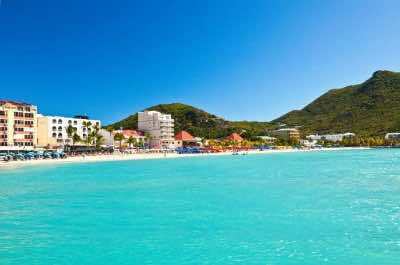 Great Bay Beach is an amazing St Maarten Beach loaded with tourist amenities and attractions. Enjoy the traditional beach bars and fun Rum shacks that add to this iconic setting. Grab an ice-cold beer from a street car and stroll along the boardwalk. It is the ideal place to watch people and be watched! Locals and tourists love to bike, stop and chat or zip along on a Segway for fun. Pick up a souvenir from one of the local stalls or stop for a bite at one of the many restaurants. Then settle down on the sand with a comfortable chair and a colourful umbrella and soak up the vibe. Swim, sun tan and enjoy this paradise setting of tropical beauty. It is easily accessible from both the town and the Cruise Port. 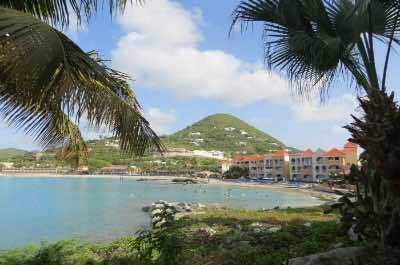 Just outside Philipsburg is a delightful little St Maarten beach called Divi Little Bay Beach. It is located on the western peninsula of Great Bay. 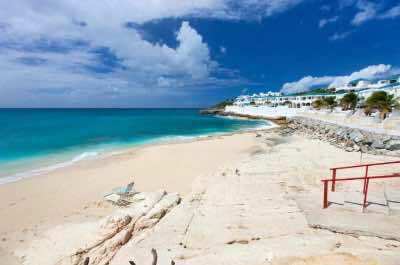 Divi Little Bay offers soft, clean white sands and blue waters that lap up onto the shore. The enclosed setting creates a natural bay with calm water that is ideal for snorkeling with a fabulous array of marine life. Lovers of water sports can choose to jet ski, paddleboat and the brave can parasail and get a bird's eye view of the coastline. Swim, relax and soak up the sun then head to one of the many restaurants or bars for a bite to eat and a glass of rum. If you feel fit, take a walk to the eastern side of the beach and explore Fort Amsterdam. It was built in 1631 by the Dutch and will thrill historians. This beach is perfect for families with children as it offers a safe environment with warm, calm water. The next fabulous St Maarten beach that must be explored is Dawn Beach. It is located on the eastern side of the Island, just south of the Dutch / French border. As the name states, this is the perfect place to watch the sunrise as it faces east, so get up early and get going! The beach offers endless, white soft sand, crystal clear blue waters and a backdrop of lush green tropical vegetation. The scenic setting also offers luxury resorts and condos jutting out on the peninsula around the bay that add to the ambiance. Rent your lounger and beach umbrella and settle down for a relaxing day. Explore the underwater marine life with some rented snorkeling gear and then head off to the famous Mr Busby's restaurant for a scrumptious meal of local treats. This is also a fabulous venue for a breakfast with a view. Looking for a fun filled day of watersports and then a relaxed evening watching the sun set over the ocean? Kim Sha beach is the St Maarten beach of choice. Located on the southern shore, facing west, this beach is not to be confused with Simpson beach nearby. The beach lies next to the lagoon, making it the perfect venue for setting sail on a dive boat for an excursion to explore the magnificent marine life. The beach is well supplied with commercial venues that will rent chairs and umbrellas and also offers a certified PADI dive shop. If you have a head for heights, book a parasailing trip and see the stunning coastline from high up. Swim, relax and enjoy the sun, there are Tiki huts set up for those who want some shade and are ideal for a picnic. Then head to the Buccaneer Bar, a favourite with locals and tourists where you can sip a sundowner and watch the sunset. Mullet Bay Beach on the far west peninsula offers slow rolling waves that will thrill surfers and those who like to watch this fabulous sport. This is a picture-perfect setting with soft white sand, azure waters and a fringe of swaying palm trees offering shade. Local families come here to spend a day and enjoy a barbecue on the beach. The tides can sometimes be strong with large waves, so it may not be ideal for smaller children but strong swimmers can have fun body boarding! The east and west sides are rocky, making it perfect for snorkeling and discovering exotic species of marine life. The beach is close to the golf course and hotels and there is ample parking. On a clear day you will have a fabulous view of the Isla Saba. Come on a weekend and join the party! The beach rocks with Caribbean music, volleyball games and other fun activities. If you aspire to an alternative lifestyle or fancy yourself as a naturist, head for the next fabulous St Maarten beach, Cupecoy Bay Beach. It is a great venue where you will left alone to enjoy your lifestyle. The beach is located in the south west corner and offers a secluded venue surrounded by high rocky cliffs, ideal for climbing or exploring for shells and other sea treasures. The water is crystal clear and the sand is golden and soft, an idyllic setting! This beach has seen its share of devastation by hurricanes and drifts and is repaired from time to time. Relax on a lounger under an umbrella and enjoy the beautiful setting. Swim, walk or have a picnic. If you come early, you may even find an empty cave in the cliffs to call your own for the day. When evening falls, head for Danny's Beach bar, run by Danny and John. They offer exotic drinks, soft drinks and fabulous snacks like ribs and chicken. Facing west, this is the perfect venue to watch a fiery sunset over the island.